* Of Rapollane, near Dromoland. 3. “His only daughter ADA, drowned at Miltown Malbay, 19th March, 1878, aged 20. Put up by tenantry. There is not any date on them; the hall-marks are much worn, but seem to be A G, a harp and crown, and a third mark unintelligible. The donor is said to have been the first baronet, 1660-1719. Parish Registers begin in 1731. Church built in 1816; cost £900. Glebe built in 1815, cost £660. BLOOD—1799. JAMES, of Castlefergus. Arms—A fess gules between six martlets. Crest—A triton (Neptune) with trident and crown. JOHN BLOOD, of Castlefergus, descended from EDMOND BLOOD, of Macknay, Derbyshire, who settled in Ireland late in the reign of Elizabeth. His son Neptune was born at sea, and took as his crest the god Neptune, so singularly and grotesquely misrepresented on this tomb. Arms—Arg. a fess gules between 6 martlets. Crest—A Neptune crowned and with trident. From T. J. Westropp. M.A. Kilnasoolagh Church, near Newmarket-on-Fergus, is first named as Killomsolech in 1302, Cilonasuibhleach in 1312, and Cil Subhalaigh in 1317, in the Papal Taxation and Cathreim Thoirdhealbhaigh. Little trace of the older church remains, save numerous fragments of an ornate window of the fifteenth century. The inscriptions of some of the old monuments are noted in this Journal (Vol. II, 1894, p. 51; Vol. III, 1897, p. 399 [both above]); and “The Journal of the Royal Society of Antiquaries” (Vol. 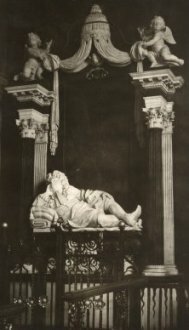 XXI, 1890, p. 76), to which we refer for the long epitaph of Sir Donat O’Brien, a photograph of whose elaborate but tasteless monument we here give. Sir Donat O’Brien was son of Col. Conor O’Brien, of Leamaneagh, Co. Clare, and the notorious Mary Mac Mahon his wife (“Maureen Rhue”), who played a marked part in the rising of 1641. Conor fell in a skirmish with General Ludlow, and was brought nearly dead to Leamaneagh, 1652. Mary, as soon as he was dead, drove to Limerick, and made terms with the Parliamentary Generals, thus saving the property for her son. She is said to have married Cornet Cooper, a parliamentary officer, on the evening of the day of her husband’s (Conor) death. In fact, the monument was put up by Henry, second son of Sir Donat, and not by his grandson, and was made by Kidwell. Sir Donat was ancestor of the subsequent baronets down to Sir Lucius O’Brien, who proved his claim to the Barony of Inchiquin in 1855 (on the death of James, 3rd Marquess of Thomond, and 7th Earl of Inchiquin), succeeding as the 14th Baron. The church has recently been greatly improved by various tasteful memorial windows. The elaborate chancel-screen and new east window, and the furnishing of the chancel, have been given by the present Lord and Lady Inchiquin. A figure of an angel pointing upwards stood near the feet of the statue of Sir Donat; but it fell, and was broken, and has not yet been replaced. The monument of Sir Donat O’Brien has been recently illustrated, and the epitaph has been published inaccurately in the Journal, vol. ii. (1893), p. 281, vol. vi. (1906), p. 435 [both above], and R.S.A.I. Journal, vol. xxi. (1890), p. 76. We recopy it. The church is the Kellomsoleach of the Taxation of 1302. Only a few fragments of a well-executed fifteenth-century window, with large tracery, and the head of an ogee light, the latter now set in a cottage at the shore of Lough Gash, to the north-east of the church, remain of the older building. Siste gradum ac intuere | sub hoc marmore conditur quod mortale fuit | Donati O Brien Baronetti | Qui patrum stemmate nobilis erat | Virtute propria longe nobilior | Homovere ad humanitatem factus | Totus ad fidem, amicitiam gratiam, natus. | Statura corporis procerus fuit et decorus | In aspectu dignitas, in sermone majestas, | in incessu gravitas, | in moribus simplicitas, | prudentiam, æquin imitatem, authoritatem indicabant. | Si patrem aspicias, nemo indulgentior | Si avem, nemo benevolentior | Si maritum, nemo amantior, | Si amicum, nemo candidior. | Non Sibi suisq. solum vixit sed aliis, sed patria. | Pauperes sublevavit citra spem gloriæ. | Sine partium studio æri publico invigilavit. | Omnibus favorem concilium mensem imperlivit. | Nulli (ubi opus erat) reprehensionem denegavit. | Comitatus de Clare patronum ubiq. ostentat. | In consessu pacis per 30 annos primas tenebat. | Animo, semper fortis; justicia, integerrimus, | viæ publicæ & pontes commercii fautorem prædicant. | Ecclesiæ parochialis ornamenta vere filium loquuntur, | pastores ortodoxi ab impiis perduellibus agitati | beneficiis ejecti & per vim sceleratam, grege orbati, | in ædibus suis (quoties pro iniquitate temporum fas erat) | sibi vicinisque, non sine periculo datum, patrocinium, | charitatem, infratrem, pro religione zelum demonstrat. | His meritis sua præmia accumulavit fortuna opibus et honoribus tam eximiæ virtutes ornabantur. | Privatis regnæ consiliis sub Anna Regina interfuit. | Patrimonium prope et insigniter auctum liberis legavit. | Suæ desiderium bonis omnibus reliquit | _______ | obiit 18o die Novembris 1717 Anno ætatis suæ 76o | _______ Hoc Monumentum in perpetuam vere & | sinceræ pietatis memoriam posuit Henricus | Filius natu secundus solusq. Superstes | sumptibus suis. Kidwell fecit. Near this spot are deposited the remains of Mrs Anne Banks of Limerick widow who bequeathed property exceeding £3000 in trust for such charitable uses as to her executors should seem fit in the wide distribution of her bounty the poor of this parish (in which she long resided and the infirmary of Ennis and the principal public institutions of the city of Limerick were permanently endowed). As a tribute to her memory and to record such munificence this slab has been erected by her surviving executors the Rev Wm Lewis & Daniel Gabbett Esq under whose care the above sum nearly trebled its amount 1828. This tablet was erected by Dame Clara Emma FitzGerald in memory of her loved & loving husband Lt Col. Sir Augustine FitzGerald 4th Baronet of Carrigoran in this county & Trevayler Cornwall, born 12 March 1809 died 31st Jan 1893. Sir Augustine FitzGerald entered the army in 1823, and joined the Bengal Horse Artillery in 1825. He served with distinction under General Pollock in the Afghan Campaign in 1842, taking part in the forcing of the Khyber Pass, and in the actions of Tizoon, Hoti Kotal, and the recapture of Kabul. He served on the staff of the Horse Artillery at the battle of Maharajpoor, and commanded the Artillery in the Black Mountain affair in the Mazara Country in 1852-3. For his excellent services on these occasions he was three times mentioned in despatches, and received five medals and the Indian Clasp, having command of the 5th troop of the 1st brigade. He retired as Lieut.-Col. In 1853. Here lies the Body of | Thomas Briggs architect | who deceased on the | sixt day of June 1782 | Aged 102 years. Here Rests in hope of A Blessed | Resurrection John Blood Esqr of | Castlefergus who departed this | Life Jany 16th 1799. Aged 78 years | This Tomb is Inscribed by his | Daughter Mrs Alice Young As | Testimony of gratitude And | A Ffection [sic] to his memory. This tomb has Arms: “Argent, a fess gules, between six martlets.” Crest, a triton with fish’s tail, and trident, supposed to be Neptune. * The arms are supported by equally grotesque misrepresentations of Mercury and Minerva, with some preposterous cherubs. * The family legend is that one of their ancestors was born at sea, and so was named Neptune, whence the family name and crest. Anthony Colpoys Esqre | of Ballycar | in this county | Born December 1774 | Died January 1848 | For other foundation can no man lay | than that is laid who is Jesus Christ | 1 Cor. iii. 2.